If you're looking for a villa within walking distance of the popular Coral Bay Strip and its array of cafes, bars, shops and restaurants, look no further! 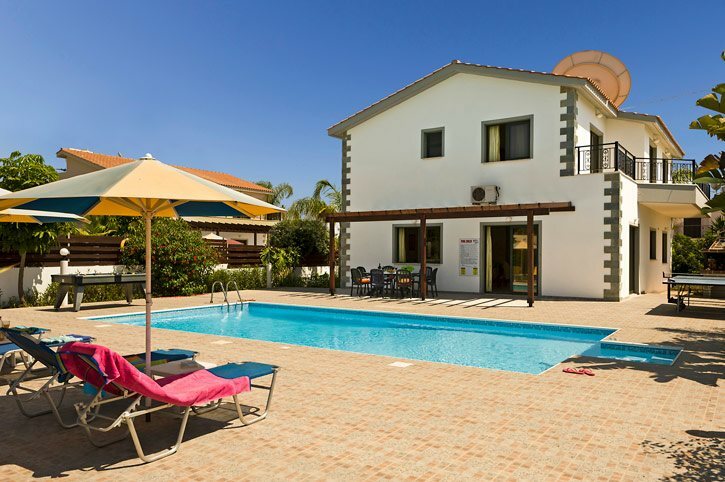 Villa Hermes is in a great central location with the Blue Flag Beach of Coral Bay being less than a mile away, plus the town of Paphos is only 20 minutes by car or bus. The property is bright and spacious and has a large private swimming pool. Air conditioning/heating in all 4 bedrooms as well as WiFi are included. A fantastic central location and a large private swimming pool - the best of both worlds! The outside area is simply great. This is an ideal place to soak up the Cypriot sunshine and have a splash in the large private swimming pool. There is an exterior dining set and a brick BBQ which are all much needed ingredients for an alfresco way of living. The games tables are great for everyone to enjoy. There is off road parking for your hire car and the front door opens into a spacious living area. The lounge is stylishly furnished and has comfortable seating, a flat screen TV and access to the pool area. There is a dining area next to the well-equipped kitchen which is great for socialising in the evenings after exploring all those beautiful places in Cyprus. An archway from the lounge/dining area leads to a ground floor twin bedroom which has access to the pool area. There is also a separate shower room. On the first floor there are 3 more bedrooms - a double with an en suite bathroom, a twin and another double - which all share access to the private balcony overlooking the swimming pool. All bedrooms are spacious and tastefully decorated. There is also a separate shower room on the first floor. Villa Hermes is located in a small cul-de-sac, around a 5 minute walk from the main Strip of Coral Bay with plenty of shops, bars and restaurants. What's more the Blue Flag Beach of Coral Bay is within a 10 minute walk and Paphos Harbour is a 20 minute bus or car ride away. This villa is a great choice if you don't want to drive on your holiday. Our Villas Coral Christina and Heracles are next door. There is a supermarket 660 yards away from the villa with more choice on the main Strip where you can find an array of shops including mini markets, souvenir, jewellery and leather shops. Alternatively, the lively town of Paphos is famous for its market and is 20 minutes away by car or a bus. The market is set in a maze of lanes selling Cypriot fare including linen and lace. There is also a farmer's market in the old town of Paphos and Kings Avenue Mall which is great for some retail therapy. There are many restaurants just a short walk away from the villa and for the more traditional ambience and local cuisine head to Peyia Village which has authentic tavernas offering excellent local fayre and a warm welcome. Alternatively, Paphos Harbour has some good restaurants overlooking the sea - great for a romantic evening meal. The Blue Flag Beach of Coral Bay is a 10 minute walk from the villa which has sunbed and parasol hire and is great for water sport enthusiasts. Alternatively, a 5 minute drive will take you to the smaller beach of Corallia. Ithaki Amusement Park is situated in Coral Bay and with a mini-golf course, video games arcade and a cafe bar it's ideal for a family day out. You can also visit Aphrodite's Waterpark which is 30 minutes' drive away. What's more the popular Paphos Zoo is only 15 minutes' drive away and you can also enjoy a boat trip which can be arranged at Paphos Harbour. The entire town of Paphos is exceptional with its extraordinary archaeological sites attracting the masses from all over the world. You can also visit Aphrodite's Baths where the Goddess of love used to shower. The Akamas Peninsular is the perfect place for a hiking trip. The path is very rocky, that's why comfortable shoes are necessary. A walk through the entire park can take a whole day or even a few if travelling slower, because there is so much to see! Villa Hermes is not available to book for season as it is sold out. Take a look here at the Cyprus villas that are currently on sale. Used Villa Plus several times now so expectations were high to start with. Not been disappointed in the past, so didn't expect to be disappointed this time round - and we weren't of course. Excellent!!! Overall experience excellent, the villa and pool were great alongside the close proximity to the shops and restuarants, the two weeks flew by. Will definitely use again. A lovely villa, very spacious and ideally located for easy access to the shops & restaurants. Your company and the overall villa experience far outweighed our expectations. You are very professional and the standards you achieved were very high. Thank you for making our holiday enjoyable and memorable!! We all thoroughly enjoyed our holiday with Villa Plus. We could not fault the service provided by yourselves right from my initial contact with Vikki through to receiving our tickets and impressive pre-departure holiday pack. We would not hesitate to book with your company again and would be happy to recommend you to anyone. Excellent villa, we had alovely time and didn't want to leave. We have recommended Villa Plus to our friends who usually use James Villas. Villa Plus is far superior to James Villas. We are looking forward to using your services again next year. It was excellent - "did exactly what it said on the can!" It could not have been better. The best holiday we have had for years, it was perfect. We are thinking of booking for next year.